Learning is not always about classrooms – indeed our Oakwood Community School firmly believes in the positive benefits of outdoor education. 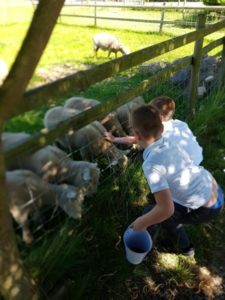 So this week we took our younger students to feed the animals at our local farm. The children really enjoyed being out in the fresh air, and interacting with the animals, especially the baby goats. We used the trip as part of our maths lesson for the day and did some work on data collection.When we returned to school we analysed the data to show how many animals were on the farm and how much food they needed a day. If the weather stays fine we will no doubt continue to explore the benefits of learning outside the classroom.